The rooms are situated under the old orange trees, along the paths of oleanders, they are fully furnished, and have a bathroom inside, they have not a kitchenette but within the village you can find a very good pizza restaurant where you can have your lunch and dinner if you have booked a full board accomodation. Reach via motorway is very simple, you have to do is take the A3 highway that connects Naples to Salerno and exit at Pompei west, turn left off exit and continue for about Pliny (0.1km), the first crossing turn left and continue for the villa of mysteries or (Porta Marina Superiore) for another (0.4km) and you will arrive at the campsite as well as highlighted on the map during the journey, follow the signs of CAMPING ZEUS. Merge onto highway A3 Salerno Naples and exit at Pompeii Pompeii. Leaving the motorway at the roundabout take the 1st exit left and continue on Via Lepanto for (0.6km). Turn left and continue for Viale Mazzini (1.6km). Turn left by Pliny (0.5km), near the entrance of Pompeii motorway turn right past the toll and continue on Via Villa of the Mysteries (0.4km), you have arrived before the entrance of the campsite. 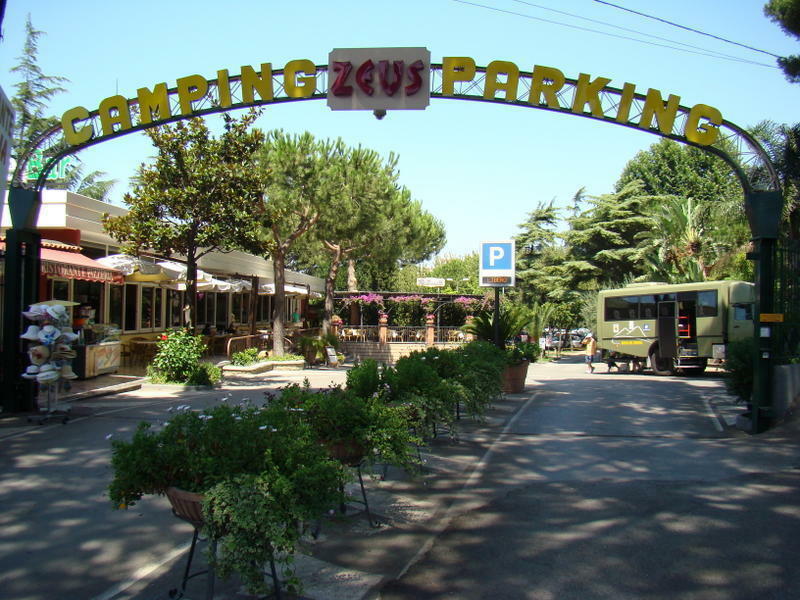 During the trip, follow the signs of CAMPING ZEUS. From the railway station of Napoli Centrale take the state of society Circumvesuviana train to Sorrento, after a journey of about 40 minutes get off at Pompeii Villa of the Mysteries, exit the station and head left for 100 meters, you arrive at CAMP ZEUS. From the railway station of the state of Salerno Piazza Vittorio Veneto to take the train to Pompeii, after about 20 minutes drive you reach Pompeii, out of the station you are in Piazza XXVIII March 1928, take the local bus On the apex and get off at the Villa of the Mysteries, from this point CAMPING ZEUS is only 100 meters. Outside the airport, arrivals side you can travel with the taxi or by bus. Go to Naples Central Station and take the train company Circumvesuviana towards Sorrento, after a journey of about 40 minutes get off at Pompeii Villa of the Mysteries, exit the station and head left for 100 meters, you've come to CAMPING ZEUS.